Uglyworld #600 - I See'd A Snake Bird Thingy (162-365), originally uploaded by www.bazpics.com. What better way to celebrate photo #600 in my Adventures in Uglyworld set (and pic #162 in this years 365 project) than to bring you yet another of Jeero's incredibly funny statements. Let me set the scene, with the World Cup due to kick off this afternoon Jeero asked what we planned to do before 4pm, to which myself and Mireille suggested going to visit the local Tierpark (animal park) in Aachen, and then to Mireille's grans to celebrate her birthday (while making sure the TV was switched on for the football at 4pm of course). Jeero loved this idea and so off we went to the "mini-zoo" with Jeero skipping and jumping all the way there. Once we paid our way through the front gate Jeero went off faster than either myself or Mireille has ever seen him before and a few minutes later he came sprinting back up the hill shouting "Quicks, you must comes quicks". This caught Mireille by surprise so she asked the little guy if someone was hurt, to which he replied "No, everyones is ok, at leasts I thinks so, buts I finds a snake-bird thingy". This "snake-bird thingy got my attention so I asked for more info, Jeero replied "Well whats I finded has the shapes of a birds but looks likes it has the heads of a snake!!!". Obviously we asked for him to show us where this "strange" animal could be found and he dragged us down to the Emu enclosure, as you can probably imagine the pair of us couldn't stop laughing at the little guy! 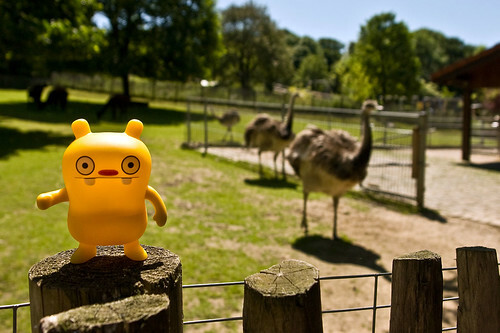 So here you have a shot of Jeero with some of those "Snake-Bird thingies". He really doesn't go a day without making us laugh so much that we end up in tears or stomach pain (or most times both).